Our theme this fortnight is “It’s a Celebration” with buttons. As it’s our FIRST BIRTHDAY at CFAS we’re having a blog hop to celebrate. The hop begins and ends on the challenge blog. If you’ve arrived from CAROL's blog you’re on the right track, if you’re just popping by to say hello you may want to pop over to the challenge to join in the whole hop. At each blog you’ll find a letter, once you’ve collected them all leave a comment on the challenge post telling us which word the letters spell. You must leave a comment on each blog as you hop and one commenter on each of the blogs will win a prize, my prize is a Bugaboo $6 gift certificate. My card is using an image from Whimsie Doodle called "Turtle Birthday" Also used on the card is MFT embossed buttons, Sizzix corners and Divine Twine. Here is your letter C, now it’s time to pop over to DWITA's blog to carry on the hop. If you get lost along the way you'll find a full list for the hop on the challenge post. Enjoy! He is just too cute :) Love you color combo. Beautiful card! Such a gorgeous card Dawn, so clean and fresh. 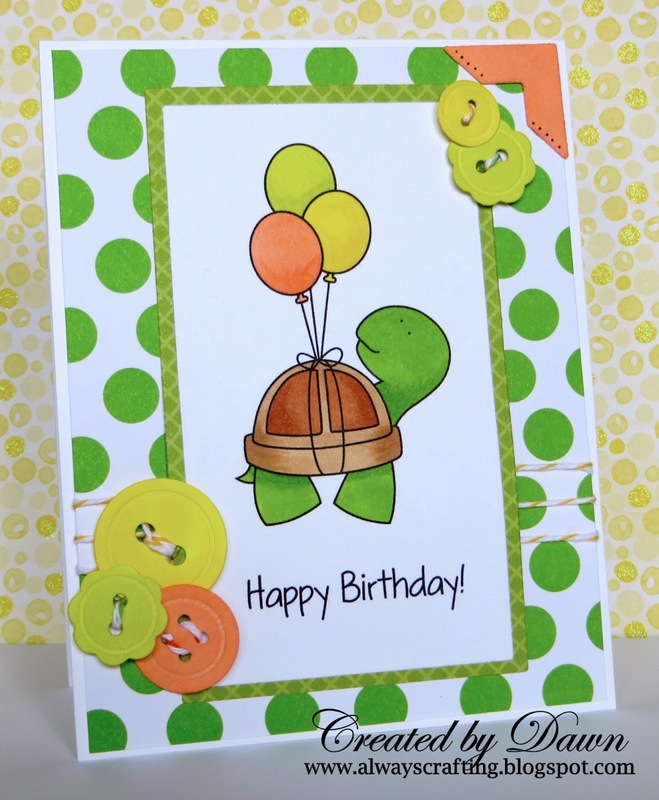 Like the whimsy Turtle card with the buttons. Your card is too sweet. I really love it! Thanks for the letter from the bloghop! Such happy colors! Looks so good with the colors repeated in the groupings across the card. I had to look twice to realize that those were faux buttons. Thanks for joining in the fun at Whimsie Doodles this month!!! Cute card! Love the polka dots and buttons! Thanks for joining the Whimsie Doodles Challenge! What a cute turtle - they seem to be all the rage at the moment. Cute cute CUTE!! That's one of my favourite WD images. So glad you could play along with us on Whimsie Doodles this month! hehe, this turtle with the balloons is tooo cute :) Love the color-combo and the buttons on it!